The following article, written by John Amodeo, is part of an ongoing series that focuses on a select topic of inspiration for the month. The focus for April is “Revive”. Do you remember The Visible Man, an educational model for children where the human anatomy is revealed by making the outer skin of clear plastic? 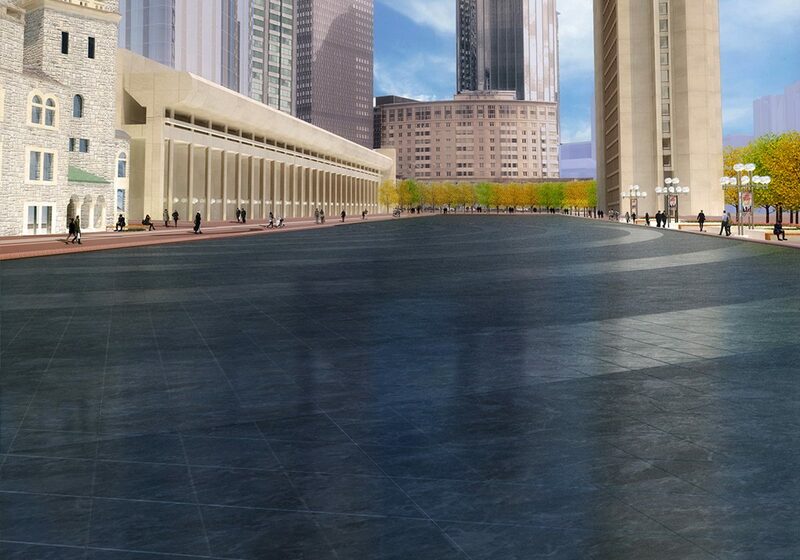 In the ongoing Restoration and Repair of Boston’s Christian Science Plaza, currently under construction, if we could make the ground plane clear plastic, you might be able to see all of the things the design team is doing to make this iconic urban plaza more sustainable. The Christian Science Plaza, the largest privately-owned public open space in Boston, is the 10-acre open space associated with the Boston’s Christian Science Center, a mid-century updating of the headquarters of The First Church of Christ, Scientist (TFCCS). The three Brutalist concrete buildings and the plaza formed by them is the master work of architect Araldo Cassutta, then a partner at I.M. Pei & Associates. They were intended to integrate The Mother Church Original (TMCO), the Mother Church Extension (TMCE) and The Publishing House into a larger balanced 14-acre urban campus. At the heart of the Plaza is the 700’ long Reflecting Pool, which makes the plaza the iconic open space that it is considered to be. 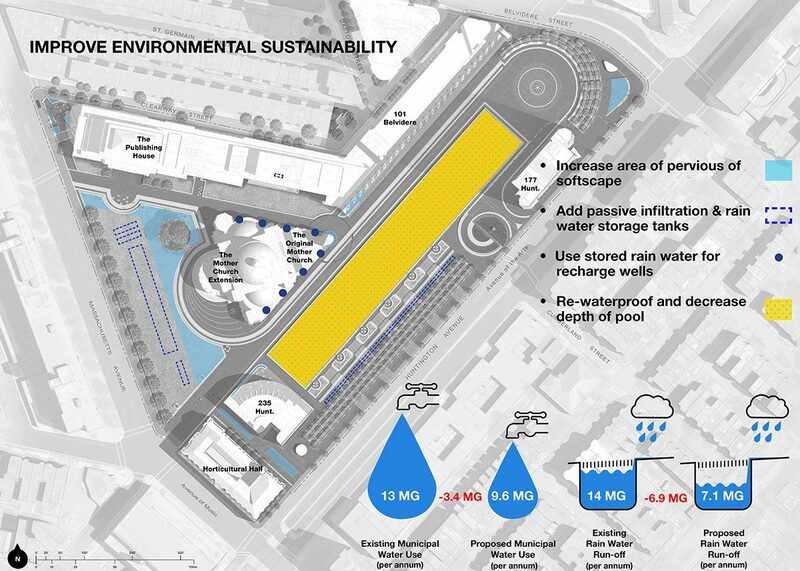 However, the water consumed by the Reflecting Pool, and the off-site disposing of stormwater runoff generated by the 10 acres of mostly hardscape plaza is considered highly unsustainable. Add to that, receding groundwater levels exposing the wood piles beneath TMCO/TMCE, threatening the piles with deterioration. The Plaza Restoration and Repair project, its first major overhaul in 45 years, gave TFCCS and their Plaza design team an opportunity to develop a more sustainable way of managing stormwater, potable water consumption, and groundwater levels. TFCCS consumes approximately 13 million gallons of municipal potable water annually for interior water usage, to fill and maintain the Reflecting Pool, to run the Children’s Fountain, for landscape irrigation, and for injection wells which recharges groundwater immediately beneath TMCO/TMCE to keep their wood piles hydrated. The Reflecting Pool requires 3 million gallons of water annually to fill it and keep it filled. While it only takes 1.5 million gallons to fill the Pool, another 1.5 million gallons was used annually for makeup water due to water loss from evaporation, as well as from severe leakage into the parking garage beneath the Pool. The irony in all of this is that 14 million gallons of water falls onto the site annually free of charge, and is then sent into a closed drainage system that was piped out to the Charles River (See Figure 1: Diagram of Water Management). TFCCS knew this was unsustainable and made it a goal of the project to improve the sustainability of the Plaza. In the Restoration and Repair project, the design team, led by CRJA-IBI Group, and with the support of DEW Inc. (Water Feature Consultant), Nitsch Engineering Inc. (Civil Engineers), JB&B (MEP Consultant), SGH (Waterproofing Consultant), and LeMessurier (Structural Engineers), developed various sustainable methods of addressing these issues, most of which are not visible to the public. The first thing was to reduce the water consumption. The Reflecting Pool and the Injection Wells were the most obvious places to look. With the Reflecting Pool, we began by eliminating the leaking onto the garage. In order to do this, we had to completely dismantle the Reflecting Pool, rewaterproof the garage roof slab, and reconstruct the Pool. This work is currently underway. This will eliminate millions of gallons of water loss annually. The reconstruction of the Pool enabled us to reconsider its original design. 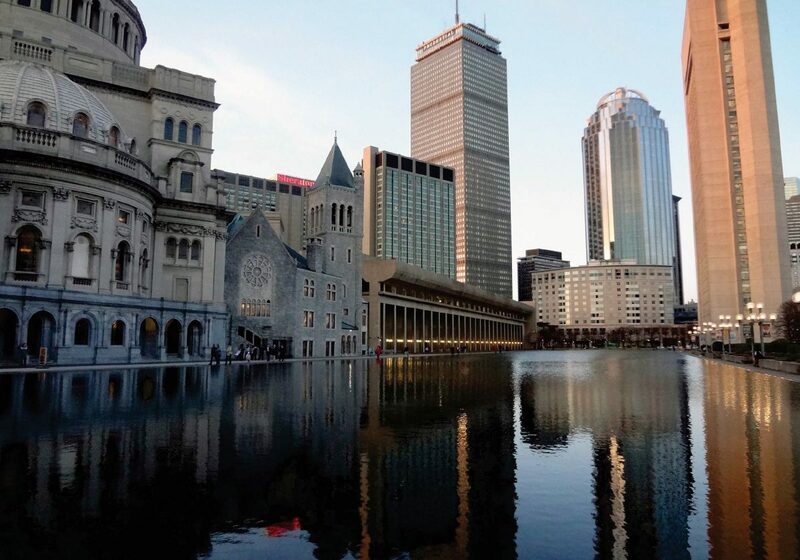 With the Christian Science Complex, including the Plaza, being a designated Boston Landmark, any changes to the original design required the approval of the Boston Landmark Commission, so changes had to be minimal, and done almost surgically. One visible change that would improve sustainability greatly would be to reduce the depth of the Reflecting Pool, from 27” depth to 8”, thus reducing the amount of water required to fill the pool. Accounting for evaporation, and the absence of leakage, the annual water consumption for the Pool, when completed, will be reduced from 3 million gallons to 800,000 gallons. What the public will see, when the Pool is full in the summer months is the same Reflecting Pool they have always known and loved (See Figure 2: View of Plaza with Reflecting Pool Filled). However, when the Pool is empty, the basin will no longer appear to be a deep empty concrete basin (See Figure 3: Reflecting Pool Empty, Existing Conditions), but a somewhat reflective honed table-top of dark granite (See Figure 4: Reflecting Pool Empty, Proposed), that will extend the reflective quality of the Pool into the winter, as well, making it a year-round aesthetic feature of the Plaza, while also being more sustainable. Another visible sustainable gesture in the Plaza Restoration is the more than doubling the size of the Massachusetts Avenue Lawn (See Figure 5), thus reducing the amount of impervious surface within the Plaza. What is not visible is the infrastructure beneath the lawn that will help manage stormwater, and help recharge groundwater. Nitsch Engineering Inc. designed a system of open pipe galleries and cisterns that will help store, treat, and recharge captured stormwater runoff, and also pool overflow water. Groundwater recharge is critical in this part of Boston because the TFCCS sits within a Groundwater Overlay District, where the first 1” of stormwater for each storm is required to be recharged into groundwater to help maintain groundwater at levels that will keep the wood piles of historic buildings submerged. The galleries beneath the lawn have been sized to handle the first 1” of each storm for the entire Plaza, including the Reflecting Pool, which is considered impervious. There is also a 25,000 gallon holding tank that will add to the storage capacity and will slow-release into the galleries. A 25,000 Dechlorination Tank in the basement of the nearby Publishing House will treat Pool overflow before it goes into the recharge galleries in the lawn, and a 12,500 Day Tank will take Plaza pavement and roof drain runoff, and treat it before it is sent into the Injection Wells that specifically hydrate the wood piles beneath TMCO/TMCE. This captured stormwater will account for 100% of the annual demand for the Injection Wells. The end result of all of these measures is that the Church’s water demand will drop from 13 million gallons to 9.6 gallons of water annually, the potable water consumption for the Injection Wells will drop from 700,000 gallons annually to zero, and the off-site stormwater runoff from the Plaza will be reduced from 14 million gallons to 7.1 gallons annually. When the Plaza Restoration and Repair project is completed in Spring 2019, and the surface is restored to its original sheen, the public who is welcomed into this refreshed space may notice some of the subtle enrichments that endow their beloved Landmark space. 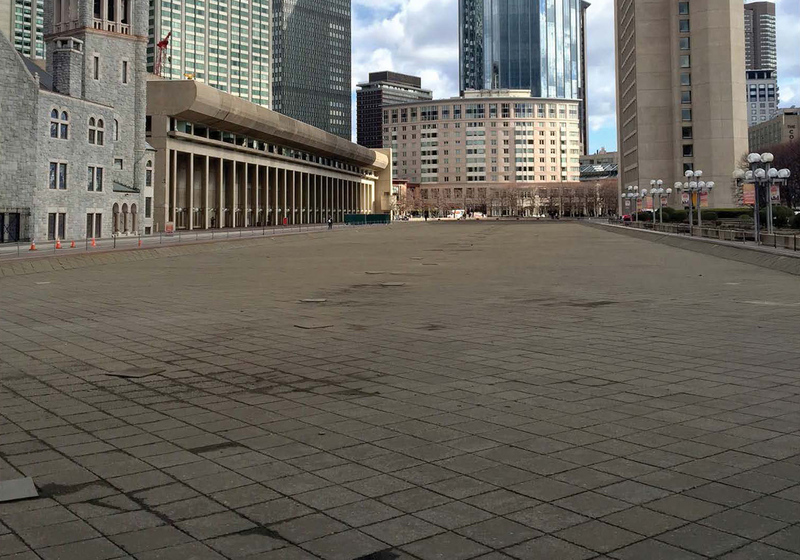 But without a clear plastic groundplane that would provide a “visible landscape,” few will be aware of the activity hidden beneath the surface that make the Christian Science Plaza as sustainable as it is iconic.